14k Yellow gold Amethyst and Diamond ring. Unique Trillion shaped center set with a very large 12mm by 12mm approx.. 4.65ct Amethyst gem. Accent diamonds total 1/3ctw and give this ring it's extra dazzle. Add size to the comment box at checkout. 14k yellow gold heart shaped amethyst ring. 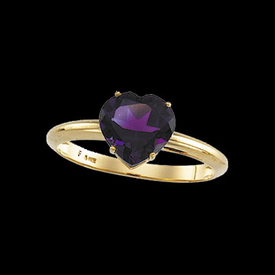 Heart shaped amethyst is a vibrant deep purple and is set on a solitaire band to create this ring style. Amethyst measures 8mm and this ring is just lovely. Stock Size 6. We are happy to size this ring for you but keep in mind, custom sized items are non returnable. 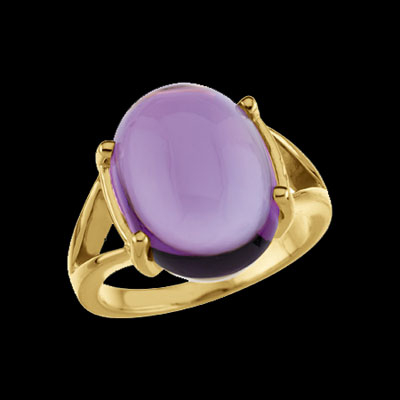 Lovely Amethyst and gold ring. Genuine cabochon cut purple amethyst measures 16mm x 12mm oval and is a great color. This ring weighs 5.10grams. 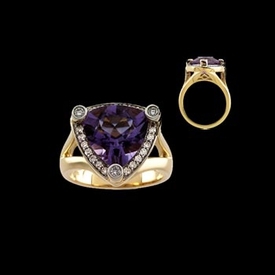 14k Gold Marquise Amethyst and Diamond ring. Marquise Amethyst measures a large 12x6mm, 1.5ct and .12ctw diamonds. You'll love this great design. Alternate center gemstone available. Stock size 6.